I have had a varied worldwide culinary career. I did my training in Switzerland and Paris. From there I moved on to London and worked as Chef saucier at 'The Inn on The Park' Park Lane. 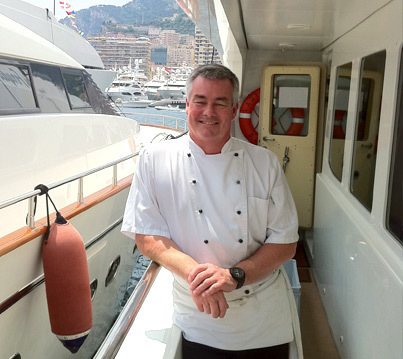 In addition I have worked at the British embassies in both Paris and Vienna, as a private chef aboard super yachts for the 2012 Monaco Grand Prix. During the summers of 2013 and 2014 I spent time working in luxury villas and chateaux in St Tropez and Normandy as private chef. I have appeared on several TV shows and was a regular on The Carlton Food Network. I have also appeared on television in Lyon and Bologna, This Morning and market Kitchen. I have done many demonstrations throughout Europe promoting British food and continue to demonstrate at Food Festivals around the country. I have won many prizes for his craft including three gold medals at Salons Culinaires competitions throughout the UK, The Tudor France award for contribution to the hotel and catering Industry and achieved Thrales's Michelin rating. In my career I have had decades of experience in restaurants, hotels, private villas, British Embassies, yachts and cookery schools. I enjoy every aspect of my job from catering an intimate dinner for two, a private dinner for eight or a corporate event for 300. Each job comes with it's own set of demands and constraints which need to addressed on an individual basis. I have an STCW qualification which covers fire fighting, first aid and casualty evacuation and survival at sea. I have taught in cookery schools for many years and enjoy sharing my knowledge with others who show the enthusiasm either professionally or domestically. I have a love of food and get enormous pleasure from looking after guests on a personal level. I enjoy the challenge of meeting customer’s expectations and personal foibles.